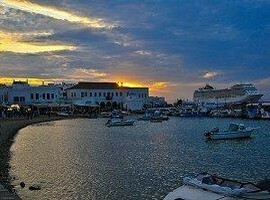 The main thing about this island is that it has everything a typical Greek island should have: beautiful beaches, restaurants and bars, while not losing its beauty because of too much tourism. 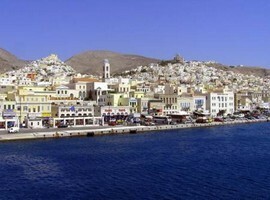 The reason for this is that Syros is the administrative center of the Cyclades, there are naval yards (Neorio Syros), and the island’s economy is doing well enough so that residents are not dependent on tourism. 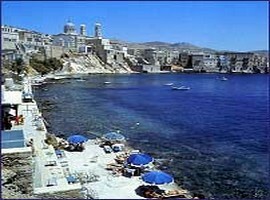 Syros has also the very unusual feature for Greece, that half the population are Catholics. 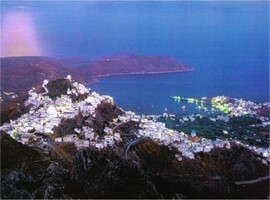 Although the island is basically barren, residents grow vegetables, make wine and herd animals. Also, the naval yard is one of the most important factors that help the economy of the island. 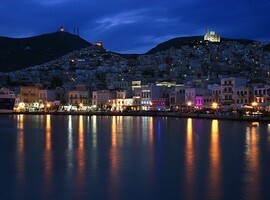 Syros is also famous for its sweets that are exported to all of Greece. 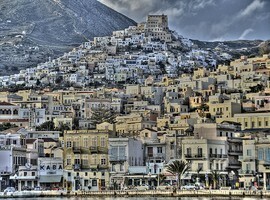 Syros has been inhabited since the Paleolithic era. We do not know who the first inhabitants were, but it could have been Phoenicians. 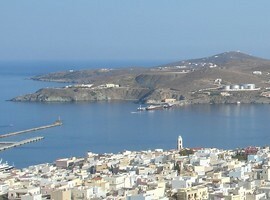 Homer refers to the island and calls it Syriis. Mythology tells us that the first resident, the Thunder came to the island on the back of a dolphin because his ship was sunk. 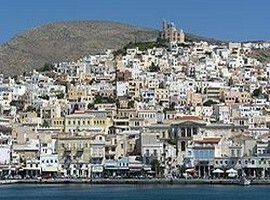 In Syros was found the oldest acropolis in the Cyclades. The most striking feature of the island is the Venetian influence on its architecture. Just like most of the Cycladic islands, the Venetians came here in the early 13th century, and stayed until the Turkish invasion of the 16th century AD. The capital is Ermoupolis, or Queen of the Cyclades, there are quite a lot of neoclassical buildings are built in an amphitheatrical way. 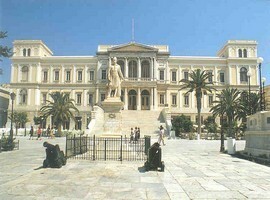 At the main square there is a statue of the hero of the Greek revolution, Admiral Andreas Miaoulis. The Apollo Theater in Ermoupolis is a mini copy of La Scala. The city also has very interesting churches, for example, St. Demetrius, Three Hierarchs, and St Nicholas. There is also a museum and an interesting library. 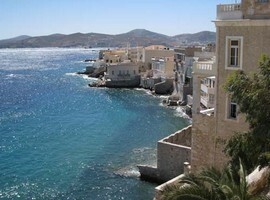 You should also go to Ano Syros, a small village in medieval style. Here you can visit the Cathedral of Saint George and the monasteries of the Jesuits and Capuchins from the 18th and 17th century. There are music festivals every summer in this village. In Chalantriani and Kastri there are excavations where Neolithic settlements have been found. You can also visit the cave with the stalactites of St. Stephen. Water sports are available at many beaches on the island. You should not miss the sunsets. 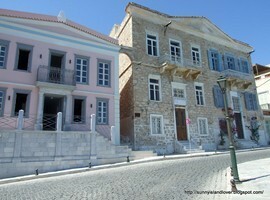 Ermoupolis is worth going for a walk and to admire the buildings Ermoupolis has a fantastic open-air cinema in Pallas will remind you of the golden era of the summer cinema. The coasts in the South and West side of the island have the best beaches. 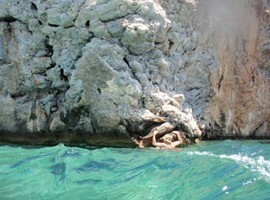 Beach Galissas is a very beautiful beach, Vari, Phoenix and Gialos are also popular beaches without being overcrowded. It is worth going to some of them. 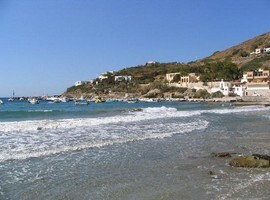 For families with children best are the beaches of St. Nicholas, Ermoupolis and Vine. 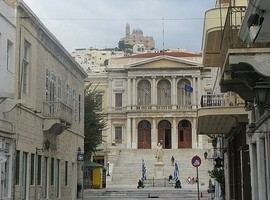 The center of nightlife and entertainment is located in Ermoupolis. There are many bars and clubs there, but partying here is more relaxed than on other islands. 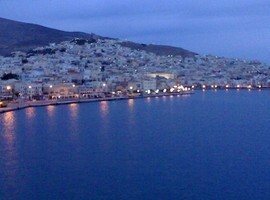 Syros has no airport but it is one of the largest shipping hubs. 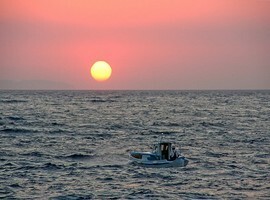 There are daily itineraries from Piraeus to Syros and the island is connected as well with most of the Cyclades islands like Tinos, Mykonos, Naxos and the Dodecanese, Patmos, Leros, Kalymnos, Kos, and Rhodes.